2016 Fall Workshop "The Great Pumpkin"
Fiddler on the Roof Runs Aug. 5th-Aug. 14th. Summer Workshop Registration now open! Willy Wonka Jr. Opens April 22nd! First Reviews are in for Footloose! Hairspray Jr. Nov. 14th - 16th! Music Man Review is in! Looking Back at U.S. plays March 14th - 16th. CCT wins 3 NYA and is nominated for 9 additional awards! 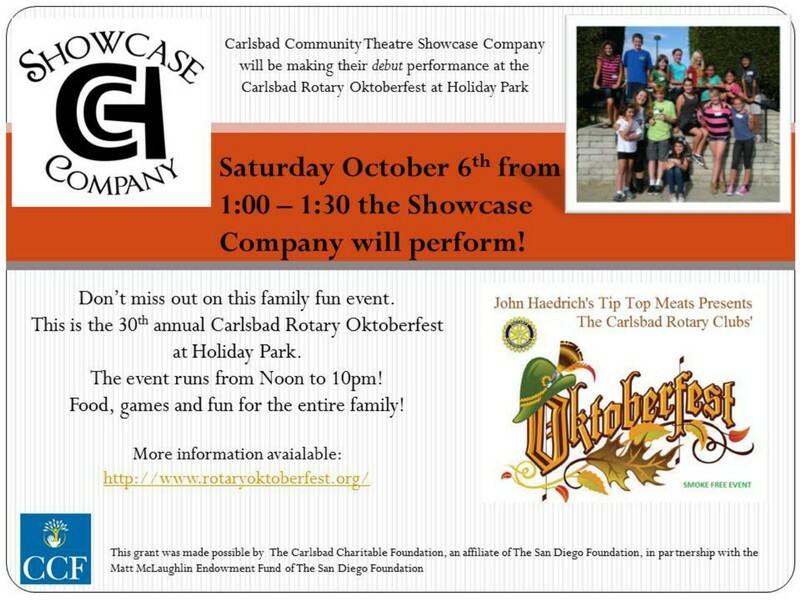 Carlsbad Community & Youth Theatre Reunion!!! Alice in Wonderland - in the paper! Bye Bye Birdie is in the news! Showcase Company will be performing throughout North County this Holiday season. Check out some of these events! Showcase Company Cabaret de l'Esprit - click on photo for review! Showcase Company presents "Girls on Broadway"